Never has the gap between a flawless technology experience and a closed ecosystem loomed as large as the gap between the Amazon Echo and the Ubi personal computer. While Amazon’s Echo works beautifully and is a gorgeous cylinder that is ready to hear and (attempt to) obey my every command from pretty much anywhere in the room, it fails because its abilities to connect with a variety of web services are very limited. Meanwhile, the Ubi, a voice-activated computer that is older and, yes, much more painful to use, wants to do the same thing. Like a teenager, though, it isn’t adept at listening to my commands, sometimes awkwardly interrupting my conversations, and its music playback is not nearly as graceful as the Echo’s. But what the Ubi lacks in technical ability it makes up in a democratic willingness to try to control a variety of web services via If This Then That, SmartThings and others. If you combined Ubi’s openness with Amazon’s grace and technical acumen — provided by the powerful speakers inside the Echo and the seven-mic array that pics up your voice from across the room — you’d have the perfect voice-activated digital assistant. Instead, I paid the [company]Amazon[/company] Prime member price of $99 (it’s $199 for non-Prime members) for what is basically a voice-activated timer, task list and way to access my Amazon Prime music library. 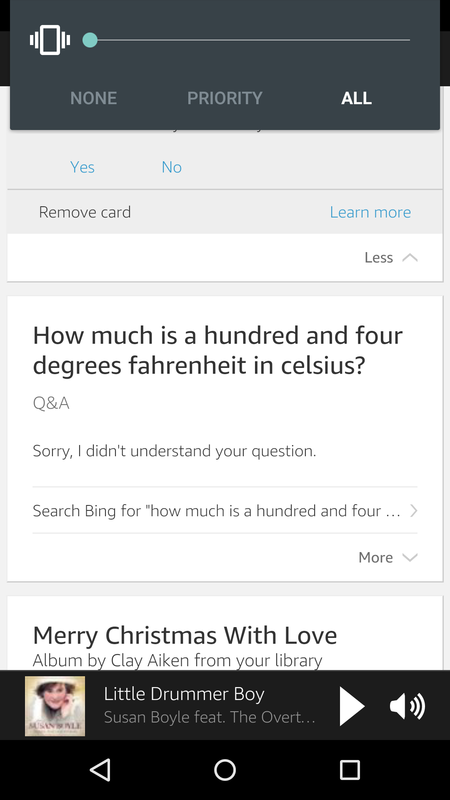 The Echo also answers questions via a Bing search about 70 percent of the time it’s asked, although some basics — such as my requests to convert a temperature from Fahrenheit to Celsius — proved unintelligible to the Echo (you can see that in the screenshot below). Echo recognized requests from half a dozen people, including two children, although my daughter is having a hard time with Echo because she can’t always say “Alexa,” the wake word we use for the device. (Sadly, you only get two options for your wake word: Alexa or Amazon, but a spokesperson from Amazon says it will add more wake words over time.) You can’t change the search engine, so you’d better love Bing. Before I get too deeply into my review of the Echo, let me pause to explain how it works and what it can do. 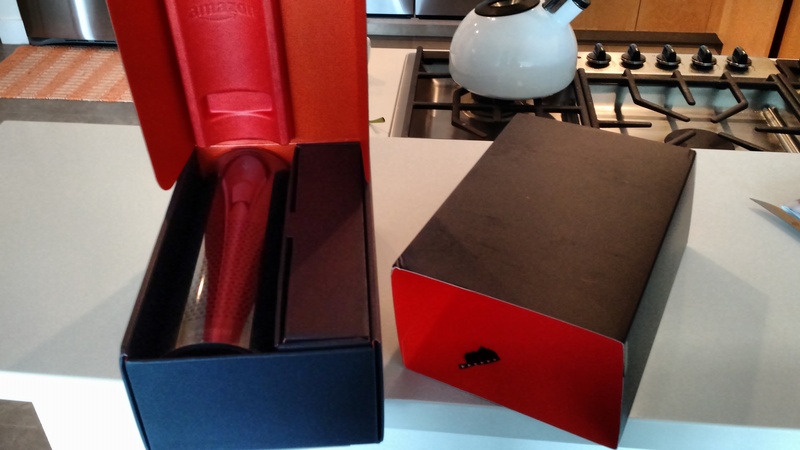 The device is a little under nine inches tall and is about the diameter of a wine bottle. It has a ring of lights at the top that acts as an indicator, showing it has heard your command, and can be turned to raise or lower the volume. As electronics go, it’s elegant enough to sit in a visible place in your home. Mine’s on my kitchen counter and I can talk to it from just about anywhere in my downstairs living room, dining or kitchen area. When you open the package, setup takes less than 10 minutes and requires you to go to Amazon’s site to download the Amazon Echo app to your Android phone. The app lets you customize things such as your zip code (so Echo can get weather and news for your area), plus specify important elements such as purchasing preferences. The app uses the card format you may recognize from Google Now. For example, the automatic purchasing was turned on when I got the device, which meant that I could just tell the Echo to buy Taylor Swift’s album and could have it in my music library immediately. Thankfully, I don’t have one-click ordering turned on, and as added protection against my eight-year-old’s love of Top 40 songs and instant gratification, I also added a PIN number I need to enter before making a purchase. You can use the app to see what the Echo heard when it misses your verbal request, and to check your Shopping or To Do list. It’s also where you can go to create multiple profiles so you or your partner can share a single Echo but have multiple To Do lists. I’ve found the app to be a good place to troubleshoot when the Echo gets things wrong. It is also popular in our house since we occasionally ask the device for the Spanish translation of an English word, and the translation goes into the app because Echo doesn’t know how to speak it. Like any new tool, the Echo takes a bit of getting used to. I imagine in a few weeks it will have completely supplanted a few items in my home, such as the egg timer. I like the timer setting, although the alarm is a bit quiet. I use it for cooking, but also for keeping track of time — “Alexa, set a timer for 4 pm.” I also like asking it to tell me the time since we can’t see the clock from our living room couch. We’ve been adding things to a shopping list though Echo, although we don’t use that as our master list yet for the weekly run to the grocery store. We also haven’t tried out the feature to let our daughter bring up webpages on her Kindle Fire tablet for schoolwork, but I’m looking forward to that. The idea is that she can say “Alexa, search tornadoes on Wikipedia,” and the page will come up on her Fire Tablet. We dislike the Echo’s Amazon-centric worldview. My family spends plenty of cash on Amazon each month, but our lives are managed via Google calendars and our entertainment is on Netflix, Spotify (mostly consumed over a Sonos) and Hulu. Our home automation runs the gamut from Philips Hue bulbs to a Nest and Chamberlain garage door opener integrated with SmartThings and IFTTT. I’d like to bring those devices and services into the Echo. Amazon does have integrations with TuneIn and iHeartRadio, and I would expect to see more integrations coming since the brains of the Echo are hosted in the cloud and can be updated over time. Amazon’s spokesman does note that other Amazon products have an SDK and that Amazon does want to hear from developers about what they want to do with the Echo, so there’s some hope out there, although Amazon is a company that is known to build proprietary versions of existing open source platforms. 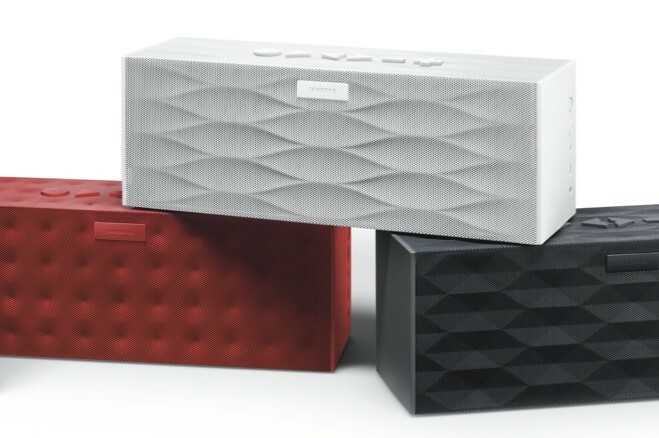 Is the Echo a Jambox rival? 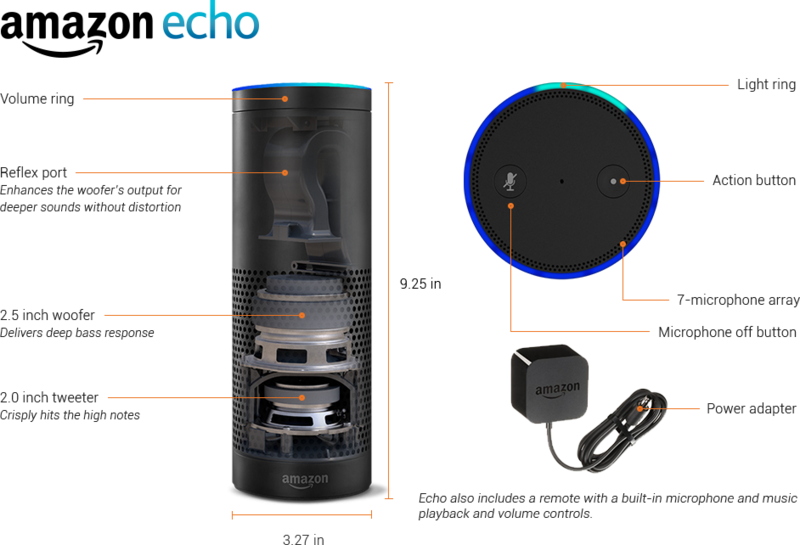 The Echo also acts as a Bluetooth speaker playing music via Spotify, Pandora and other services via your phone, so people considering a Jawbone Jambox might consider Echo instead. It sounds as good as the mini Jambox, although it’s not as adept with the bass. You have to control playback via the phone, not via your voice. Expansion packs for languages, so I can query for vocabulary or questions in other languages. Home automation control so I can integrate it with my Nest, Hue lights or SmartThings. A safe mode for my kid, so she can’t purchase anything, but also so she can’t inadvertently play music or send websites to her Kindle Fire that she shouldn’t. Ideally, this would be based on voice recognition. A way to link two Echoes together and sync them, the way you can with a Sonos music player in party mode. As speakers go, these sound pretty good, so some people might use them all over their house instead of investing in multiple Bluetooth or Sonos speakers. As a consumer and Amazon Prime member already, I’d pay $100 for the Echo because I’m old and having voice-controlled access to Amazon’s Prime Music streaming service fits my musical tastes (long live the 90s!). Plus, I like the list features and have a chunk of my music on Amazon’s cloud already. If I weren’t a Prime member this would be a much tougher sell. If I hated the existing Prime Music offerings, I wouldn’t buy the Echo unless I already bought my music on Amazon and kept it in Amazon’s cloud, or if I were a big user of TuneIn or iHeartRadio. But I do see the device as a unique, well-done offering from a technological perspective that could put Amazon deeper into people’s homes if it manages to open it up a bit more. I like the Echo and find myself looking for more ways to interact with it, and hope those come along in the near future. If Amazon is really a company hell-bent on getting more data to sell me more physical and digital goods, then the Echo can gather a lot more data about a lot more devices if Amazon wants to let it control more things. So both from a selling-more-Echoes perspective and a business-strategy perspective, my hope is that we see Amazon open Alexa up. And yes, I did say that again. I’ve had mine for a few weeks now and am enjoying the experience but waiting for additional functionality, which I’m sure will come. One grip I have is that my remote isn’t working well at all for using Voice Commands (physical buttons working perfectly). Any one else having remote issues? Just got mine. Killer App Numbers one and two. 2. Set appointment for 2:00 Thursday, Acme widget pickup rocket launcher. >Have appointment go to corp Exchange, Office 365, Google apps, my outlook or what ever I use. I know this is obvious but it’s all I would need from this thing to make it really useful. For 99 dollars, the ability to play music by voice command, use it as a bluetooth speaker, shopping list, to do list, Alexa how is the weather today ? What time is it right now from any corner of the house and an occasional general knowledge question like – what is the height of mount everest, are sufficient for me. If Echo matures beyond that – great. If not, i have already got my money’s worth. I just got the invite from Amazon to order an Echo so I bought it. I think it’s very limited and I’m buying it in hopes that in the next few months they will update it with more functionality. I would love to have echo read my texts and reply to them when working in my home office. Imagine if it could adjust your home temperature when connected to Nest? Either way, I’m not too upset that it’s limited considering the low price point for prime members. At worst, I’ll be able to listen to music, get the weather, get the time, set timers, and get my questions answered (for the most part). Not to mention she tells jokes! Enjoyed your post. Echo is currently very limited, but fun. I realized yesterday that it would be great as a bathroom music / news / weather device, and it’s awesome as such. I get the weather from Echo as soon as I get up, listen to music while in the shower, then get the news while drying off. It’s like living in the future. Echo sounds really good in a small room. Much better than it did in my living room. The battle between open and closed rages on. We’ve been frustrated in the lack of ability to access real-time data coming off of these fitness devices! The Pebble seems to be a great solution – just wish Citizen or somebody would buy them and institute openness in the smart watch market. Meanwhile – it IS coolio to access cloud based media libraries. Ideally I’d like to be able to search for “of all the gin joints, in all the world, she walks into mine” – and have it bring up that exact scene in Casablanca – while I’m sitting on the couch. One day Stacey – one day. Google needs to build something like this that would integrate with their services. If they proceed it at $100 I would buy 3 or 4 and place them throughout the house. Strangely, I asked my echo a word-for-word repeat of your fahrenheit to celsius problem shown in your screenshot and got the proper response no problem. That’s great. I thought it was strange it didn’t work when I asked, which is why I showed the request in the story, but maybe it also shows that the platform is learning. Or maybe it was just a weird glitch. I think the Echo is amazing. I love the tech and how smooth it is. And I’d love to see it do more so it can become more useful to me and to others, because i think the voice recognition is down pat and I want people to buy this and embrace voice as a viable UI in the home. I can’t blame amazon for pushing Prime (which I also love. I just don’t want it to push Prime at the expense of keeping others from embracing the Echo, because I think the Echo could be a game changer for voice UI in the way the iPhone was for touch UI if the ecosystem gets big enough). Hell, I probably should have written that in the review. I’m in when it opens up to the gamut of services and when there is a stereo satellite speaker that just works if it’s in proximity to a main unit. Experience with Amazon tells me that neither will happen. That’s ok, something of equivalent prowess in the room will show up that _is_ open. Or maybe Ubi can match both it’s prowess and its audio quality. “I also added a PIN number “. Really?? You want to add a Personal Identifier Number Number? Sorry, a pet peeve of mine. Every time I say or type ATM machine my inner grammar nerd lets out a wail of of agony so intense I have to down a gin and tonic later that evening to quiet her. So I empathize with your pain, and apologize for bowing to both convention and expediency when I blog. The bad news is I am terrible at grammar on the fly, but the good news is I am basically resistant to malaria by this point thanks to the quinine in my tonic.